E Condos is a landmark development coming to the corner of Yonge and Eglinton (located at 8 Eglinton Ave E). Already considered one of Toronto’s most desirable and dynamic neighbourhoods, Yonge and Eglinton is about to get a whole lot better with the upcoming launch of E Condos, from Bazis, Metropia and Riocan. E Condos will be ideally situated on the north east corner of this celebrated intersection. E Condos will be two towers (65 and 45 storeys, 736 and 266 suites), and completion is scheduled for 2017. The neighbourhood is attracting professionals who want to eat, play, party and live in the heart of Midtown Toronto. They especially want to be as close as possible to this particular intersection for one very good reason: exceptional public transit — an increasingly desirable feature for Toronto real estate. Yonge and Eglinton already has the Yonge subway line for easy access to downtown Toronto’s Financial District. This will soon be expanded with the much-anticipated Eglinton Crosstown below grade LRT, adding a convenient east-west transit link. Combined with a thriving corporate culture, a dynamic retail environment, and enough restaurants and entertainment venues to dine out on every night, it’s easy to see why Toronto’s young and upwardly mobile are flocking to Yonge and Eglinton. E Condos will make the most of its coveted location, with a convenient underground connection to both the transit lines and the Yonge-Eglinton Centre, a bustling entertainment/shopping complex with movie theatres, Indigo, Starbucks, 24 hr Metro supermarket, and many other shops. The developer behind E Condos is Bazis Inc., one of Canada’s prominent residential developers, renowned as visionaries who create exquisite condo towers boasting world-class architecture in premium locations. For E Condos, they have partnered with the award-winning team of Metropia and RioCan. Metropia’s founder, Howard Sokolowski, has a rich 25 year history in developing residential communities, building more than 30,000 homes. RioCan is Canada’s largest real estate investment trust that owns and manages Canada’s largest portfolio of shopping centres. E Condos’ architecture is by Rosario Varacalli, the architect responsible for envisioning the transformation of the corner with these two modern towers that will befit the landmark status of the location. Street level retail space and a lower level retail concourse will provide convenient access to daily essentials. The commercial area will be managed by partner RioCan. Inside the residential space, stunning 20 and 30′ high lobbies will provide a dramatic welcome, and will feature 24 hr personal concierge services. There will be two pools projecting dramatically out from the buildings. 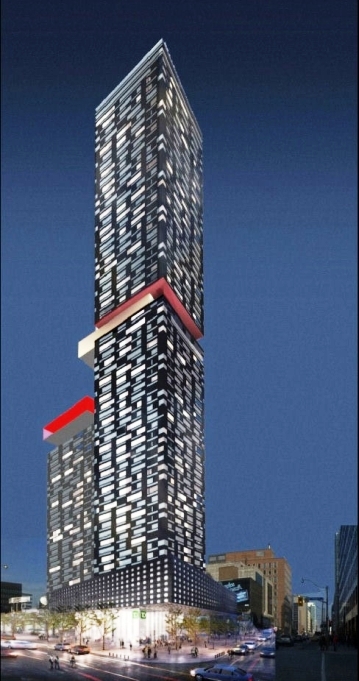 The pool on one tower will perch about half way up, while the other will extend at penthouse level. Pools will be surrounded by floor-to-ceiling windows, for breathtaking city skyline panoramas. The adjacent E-Sky Lounges will provide stylish and convenient gathering places to chill out and admire the views. In addition, each tower will feature another entire floor exclusively devoted to more spectacular amenities. These will include a range of stylish spaces, both indoor and outdoor, including a state-of-the-art gym, dining areas, party and games rooms, technology lounges, and more. Residents will have all-access passes to the leisure areas in both buildings. All amenity areas are designed by Mike Niven Interior Design. Suites will range in size from 400 to 1200 sq ft (consisting of studios, 1 bedrooms, 1 bedroom plus dens, 2 bedrooms and 2 bedroom plus dens). As always, Varacalli has designed spacious units with large windows and balconies in every suite. Suites will start in the mid $200,000s, offering exceptional value for such a premiere location. >>Click here to contact me if you are interested in this project, or any other Toronto condo or loft development.